When Montgomery County, Maryland, set out to develop a bus rapid transit system about five years ago — they went big. The proposal that surfaced last year called for 10 routes totaling 92 miles, much of it built to a high standard with buses traveling in dedicated lanes. Last November, planners proposed a 92-mile system where buses had their own lanes, whether in the median or in repurposed car lanes, on all or part of each of the 10 routes. But some residents and the Montgomery County Department of Transportation resisted calls to take away street space from cars. The latest draft of the plan, which now has 79 miles of routes, has backed away from that recommendation. Under the current proposal, the only places that would get “gold-standard” BRT with dedicated lanes are Route 355 and portions of Route 29 and New Hampshire Avenue that have wide medians. Project planners say the new iteration of the proposal is more realistic, since certain areas don’t have the concentration of housing to justify dedicated bus lanes. But transit advocates point out that the original plan was meant to encourage more walkable development along the corridors. The Action Committee for Transit, an advocacy group for transit, wrote a letter urging them not to “water down” the BRT plan. “To be worthy of support, the bus rapid transit plan must put bus lanes on the most congested roads, not the least congested ones, and include lane repurposing as a major component,” it says. It’s good that planners want to take a realistic approach, but to those who don’t want BRT on their street, the plan’s evolution sends a different message: yell loudly enough, and it’ll go away or get watered down. That’s a bad precedent for our public process, but worse for drivers and transit riders who will continue to be stuck in traffic. Elsewhere on the Network today: Bike Portland says a new Scion ad portrays cyclists in a disturbing light. Urban Cincy reports that industry experts are hailing a “parking revolution” across the United States. And Transit Miami highlights some of Miami Beach’s innovations in transportation. Democracy Dies in… Bus Lanes? 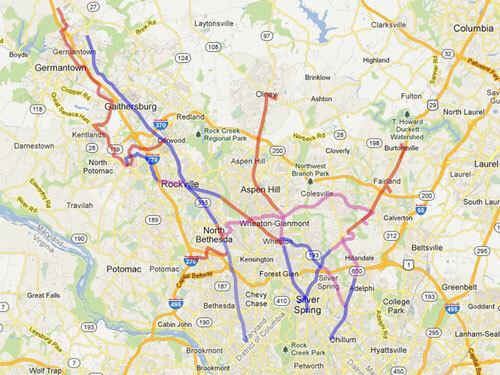 Advocates successfully got Montgomery County to consider adding bus lanes to its BRT plan. Anti-transit NIMBYs see a conspiracy. The city has started work on its first BRT route, which could be the beginning of an 80-mile network. Can the U.S. Make Bus Rapid Transit Work as Well as Latin America?